Defined simply, automation is the organization of systems and process workflows using digital technology. These technologies incorporate tools that reduce manual involvement in repeatable and predictable activities. Available tools vary in terms of their “intelligence” – some are pre-programmed and highly-rules driven. These types rely on connections to various systems, a predictable set of task requirements and perform repetitive, low value work at scale. Others are designed to mimic human thinking, learning and adaptability by generating meaningful insights as tasks are completed and data is processed.To some support purists, automation is an anathema. It conjures up pictures of robotic interaction, displaced humans and cold, impersonal customer engagement. Fortunately, this is a far cry from the automation reality for pro-automation companies today. Flexible tools and renewed conviction that service is a competitive advantage means that automation is being received differently. Instead of trying to find cheap tech to replace expensive people, companies are capitalizing on both. Automation is being deployed to free up creative people. It’s being used not to replace, but to augment companies’ human capital. Deloitte refers to this as “intelligent automation” and suggests that this approach can reduce expensive turnover, improve morale, foster innovation and create margin to apply highly personal focus on problems that actually need it, instead of wasting time on the non-essentials. It’s time to rethink customer support because no corporate function is being asked to do so much with so little. It’s expected to be fast, but personal. High quality, but staffed affordably. Agile, but tethered to CRMs, ticketing and knowledge base systems. Repetition and redundancy erode agent morale and prompt attrition. Automating technologies can be applied with chatbots, email autoresponders or AI-powered knowledge base tools to drive rapid, self-service support. Having virtual agents or systems that are capable of delivering relevant answers to common, queue-clogging issues in real-time can smooth processes and grow customer satisfaction. Similarly, non customer-facing processes may be improved through automation. Leaders may notice their teams bogged down by data processing, internal sharing, multiple system navigation or ticket tagging and transferring. These are areas where automation can be additive; restoring agents’ time for customer-centric work. Friction is anything that stands between a customer question and an opportunity for resolution. It ranges from too much hold time, to too many transfers or inadequate and inaccurate information. Automation can reduce frustration-causing friction and provide a level of responsiveness that generally isn’t possible with human agents alone. Automated customer support is not constrained by time zones, sick leave, holidays or agent hours. Nor is it overwhelmed by surges in support requests. This matters as response timeliness becomes a top satisfaction factor for customers, even for those that connect via a non-traditional channel, like social media. To manage this, leaders must amplify agent ability and availability. This may take the form of heightened customer self-service options, like assist technology that connects customers to relevant FAQs to reduce human intervention. Assists like this can dramatically lower costs too. Zendesk found that up to 80% of customer support requests are Tier 0 or 1, meaning: they can be resolved through well-optimized self-help content or at the first level of human support in one to ten minutes. Given the nature of most requests, leaders should introduce automation through relatively-cheap digital means to handle the bulk of inbound issues. 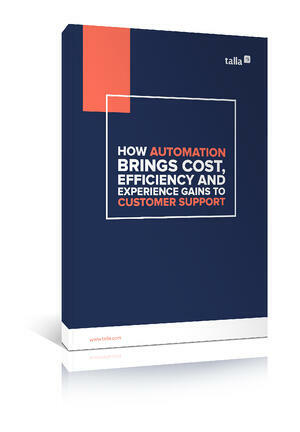 Expensive support, that is, human-led, can then be strategically applied where it’s actually needed. Less than two-thirds of support agents say they are satisfied in their roles. Another 33% say they are actively looking to leave their current place of employment. While attrition requires multi-thousand dollar investments to find, interview and onboard staff, these may pale in comparison to the downstream effects of team discontinuity, lost manager productivity and poor customer experiences delivered during seasons of turnover. With the right technology, leaders can uplevel their agents and help them feel more satisfied and committed to their jobs. They can create career-advancing opportunities like QA’ing automation workflows or owning priority ticket engagements. Not only is this more efficient, but leaders enhance agents’ experiences, increase engagement and reduce churn. Top companies get the most of out of their investments. They apply their people and their technology where ROI is the greatest. Automation isn’t about replacing people or adding robots, it’s about optimizing impact, effectiveness and experience – for agents and customers. Want to learn more? Check out the whitepaper.